Today, 92% of Buyers begin their properties search on the Internet! 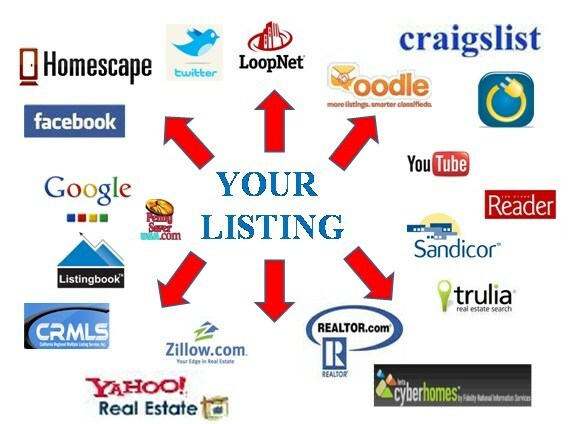 We are one of San Diego’s Top Real Estate Internet Marketers. Our Listings sell usually above average market price. Wondering how much your home is worth? Click here! The County Property Real Estates Hi-Tech- Hi-Touch Marketing Plan has been designed to sell your home for as much as possible, as quickly as possible, as smoothly as possible! Real Estate advertising has changed dramatically in the past 5 years, and it’s crucial to use the right media to attract buyers – THE INTERNET… Our multiple websites, high search engine ranking, extensive vertical search advertising, Web enhanced listings, custom home marketing websites, delivers an unmatched, high impact selling tool. INITIAL CONSULTATION: The process of selling your home begins with a no-obligation interview and listing consultation. This will give us the opportunity to get to know you, and you us. This will also afford us the opportunity to view your home and make suggestions to help you prepare the home for the market, in order to optimize the ultimate selling price you receive. We have great insight and experience with cosmetic and repair issues that will ultimately net you more for your home. During this consultation we will review our marketing plan in detail, and customize the plan appropriately for your particular needs. MLS LISTINGS: For starters, we put all our listings in the BOTH San Diego Multiple Listing Service (MLS) called Sandicor, and the Riverside area listing service called MRMLS. This not only ensures that your home is marketed to every agent in San Diego County, but also to agents throughout Riverside County. It also greatly increases the number of websites and web postings that will feature your home. Qualified Buyers are working with agents in this day of Buyer Representation, therefore being in both listing services is essential to presenting your home to all ready, willing and able home buyers. In addition, we maximize the power of the Internet to aggressively market directly to potential buyers. We place our listings into numerous Internet real estate marketing websites, and we follow up diligently with every single inquiry we receive from all the marketing techniques we utilize. In short, we take full advantage of today’s technology to market your home as aggressively and comprehensively as possible, to meet the demands of today’s marketplace. Many agents profess to market your home on the internet, but they fail to accomplish some of the above 4 most important steps. County Properties does all them ALL! 619-540-5811 …we’re easy to talk too.IMPORTANT NOTICE: Newspaper and Magazine advertisements no longer attract Buyers like they used to years ago… the Internet is the new dominate source for Home for Sale advertising… here’s why ! Newspaper advertisements often times have no photos at all, and incorporate just 3 to 4 lines of text to advertise an $800K home. The information is timelier than a magazine, but the information is lacking. Today, intelligent home shoppers will bypass the newspapers and go directly to the internet for all of the descriptions and photos they desire. Open Houses are less effective than they used to be years ago. Prospective homebuyers realize that when going to Open Houses you often don’t know the Price, Size or features of the home. Using the Internet, prospective buyers can search through thousands of homes for sale, and in just minutes, select the hand full homes that meets their specific wants and needs. Please don’t misunderstand us, will still advertise in traditional print media if you like and conduct Open Houses. But if you want to obtain top dollar for your San Diego home by maximizing the exposure of your home to as many prospective internet savvy home buyers as possible, then you need to list with a Real Estate company that thoroughly understands and maximizes the power of the internet… that’s us…County Properties. Want to know how much your home is worth? Fill the form here for a free professional analysis.